This mixed lettuce bowl has been specially selected for better performance, faster growth and superior taste. 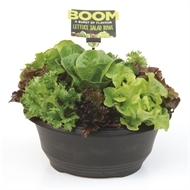 They are the same varieties as grown by market gardeners and offer professional results for the home gardener. Harvest as required. Allow moderate sunshine.